Last week I chimed: "Only Windows 8 can save the PC market now". Weak consumer computer sales forebode market shifts ahead, but so do those in the enterprise. An IDG Connect study reveals just how much: IT and business decision makers are augmenting or replacing PCs with iPads at an alarming rate. "Fully 51 percent of IT and business decision-makers say they always use their iPad at work", according to the report -- and, of course, that's the number who actually own the tablet. Sixteen percent have replaced their laptop with an iPad and 54 percent supplement it. Remember, these numbers are for people responsible for corporate computing. As the wind shifts in their sails -- or should that be sales -- so does it eventually across the computing infrastructure. The data suggests that iPads are significantly starting to cannibalize PC sales -- and not just among consumers -- and it's consistent with recent global PC buying trends. For PC vendors and Microsoft the most troubling data comes from some international markets, where Apple has done well recently, and emerging locales that still aren't PC sales saturated like the United States is. In the Middle East and Asia, 70 percent and 63 percent, respectively, of IT and business professionals have "partly replaced" their laptop with iPad. "In South America, 27 percent have 'completely replaced' their laptop with an iPad", according to the report. "In Europe, the figure is 23 percent". In Africa, 47 percent of iPads are purchased by employers -- 40 percent in Europe. In some global markets, then, consumerization of IT is much less a factor bringing iPad into the workplace. Businesses buy the tablets, and professionals use them for work, primarily for web browsing, reading and news consumption. Web browsing includes accessing work-related assets on local intranets. "These findings suggest that a substantial number of professionals regard their iPad as a viable business tool", according to the study. The implications for Microsoft are staggering. There is no Microsoft Office for iPad, yet IT decision-makers are supplementing or replacing their computers with Apple's tablet. 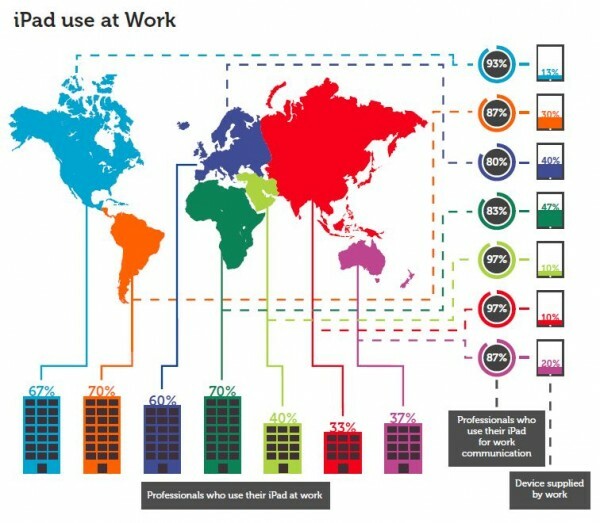 However, work usage habits vary dramatically by region, which not surprisingly is in line with Microsoft core markets. According to the report, "North Americans use their iPads slightly more intensively than the global norm, with a strong emphasis on web-based functionality". If persistent rumors about Office coming to iPad aren't true, perhaps they should be. And if anyone is looking for reason why the rumors could be true, here it is. "Our survey also suggests that tablet computing is transforming patterns of content consumption. iPad-owning IT and business professionals are rapidly migrating away from newspapers and printed books, toward digital alternatives. To a lesser extent, they are moving away from DVD-based audio-visual content towards wholly-digital alternatives. This transition is taking place with striking speed. As tablet computing emerges into the mainstream, both media owners and marketers who produce content will need to consider the implications carefully". That finding sheds some perspective on Apple's media event planned for January 19 that is rumored to be education related. What if education means something more than e-textbooks, as has been rumored? The more important question, if you have an iPad, has it displaced or even replaced your work PC?